The last 2 nights, we slept with our dog, Laydee - right in the middle of our bed. What a snuggler she is. She actually hugs you. Tonight though, she can sleep in her own crate. She does tend to hog the bed. She sleeps on top of the covers, in case you're all going, "Ewwwww." Hey, she's family, and we love her to pieces. It was a treat for all of us. 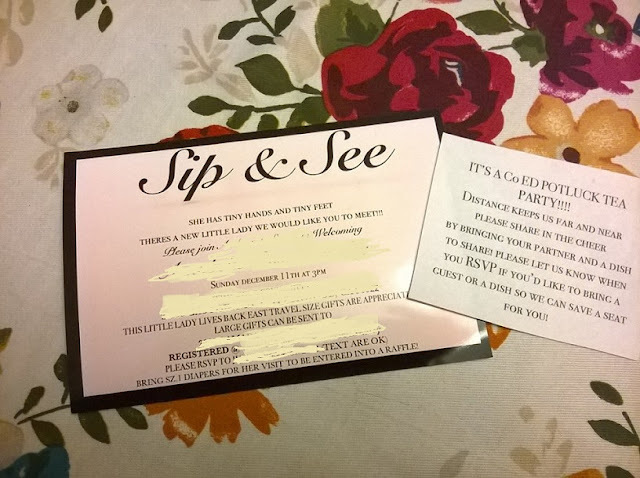 I received an invitation, to a baby shower for next Sunday. The baby is already here and lives in Texas, and will be here, next week for the shower, given by the Grandma and friends she went to high school with. She is a nice young lady - I only met her once and most of my interaction with her is on Facebook. I know her mother. (The Grandma) However, her mother and I, have not seen each other in about 4 years. She keeps saying how we MUST get together soon. - I guess this Sunday, is "Soon." I am a contented, happy introvert. I don't like baby showers! I just don't feel comfortable, especially since I would be going alone. We're supposed to bring our partners along. Well, my partner will be working. (he works Sunday-Thursday 4pm to midnight) That's our schedule and our life. I started to wrestle with that annoying feeling, that I SHOULD go. PLUS I'm horrible at small talk. I decided, I will RSVP and send a gift to the Mom's address in Texas and be done with it. Introverts feel they always have to "explain" to those who are extroverts. Like my dear husband. First thing he says, "Oh, how nice... it would be good for you to get out." Hey, I'm fine just the way I am. I don't need to force myself to do things I don't want to do. So I am happily, NOT GOING. I'm an introvert. I've stopped forcing myself to go places. I'm happier because of it. Why would I want to go out when dogs are right here with me? You are EXACTLY right. I have my 2 kitties and my dog. When we had our corgi, he always slept on the bed (except near the end when it was difficult for him to maneuver around with his blindness, etc). He often hogged the bed too but I loved that he was there (except when he thought it was time for me to get up, as he would lay on my pillow after I left, sometimes he thought I should already be gone when he would come to stake claim to it). I'm an introvert too. I don't like going places alone or if I don't know anyone or just a few people. I'm not good at small talk or talk more than I should. I'm better, like you, to send a gift and not fret about it. I could perfectly be happy and content as a hermit. These days between online shopping and church services streamed into one's home, one doesn't have to get out at all, especially if one works at home. Love it. I believe most bloggers are introverts. LOL, yeah it helps to have a friend with you - all mine are either dead or live 250 miles away! A glass of wine helps a little.